Product categories of Waste Tire Oil Distillation Plant, we are specialized manufacturers from China, Waste Tire Oil Distillation Plant, Waste Tyre Pyrolysis Oil Distillation Plant suppliers/factory, wholesale high-quality products of Tyre Pyrolysis Oil Distillation Plant R & D and manufacturing, we have the perfect after-sales service and technical support. Look forward to your cooperation! Waste Tire Oil Distillation Plant , is the new technology which can refine the tire oil into base oil(which can be made into diesel and gasoline after processed by our catalyst) by vacuum distillation system. 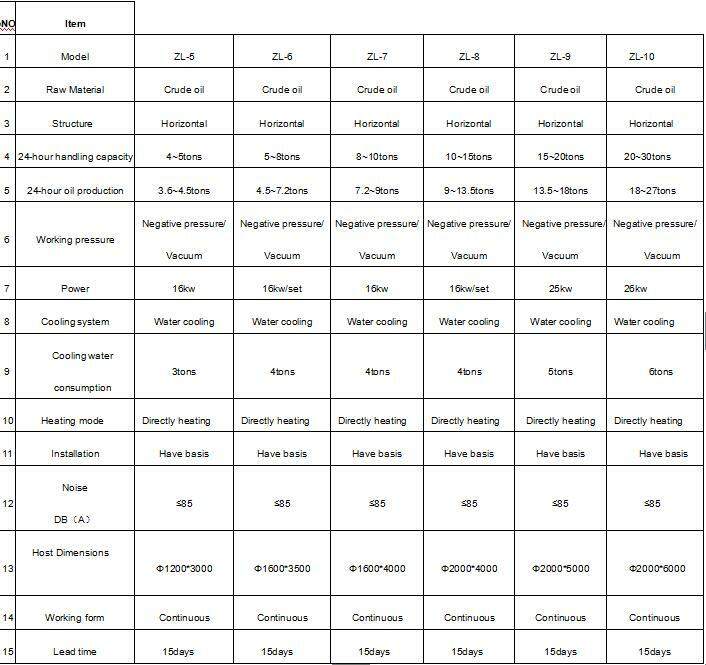 The oil quality is better than the original normal pressure distillation technology, which show on purity ,transparence, lightness .this technology will do deodorization and destinke process to the raw material oil automatically by "dry type" vacuum pressure distillation method. With the vacuum distillation technology, the distillation temperature is considerably reduced, and the oil output will higher 5%-10% compared with original normal pressure distillation technology. It makes more profits to the enterprise virtually. 4. Installation: We will be in charge of arranging our engineer to go to your place to guide the installation and train your workers how to operate the waste tire oil distillation plant ,and buyer will be in charge of the food, accommodation and round air tickets.